Photo: Caitlin Fitch The Santa Barbara Channel holds 28 species of marine mammals, big whales among them. 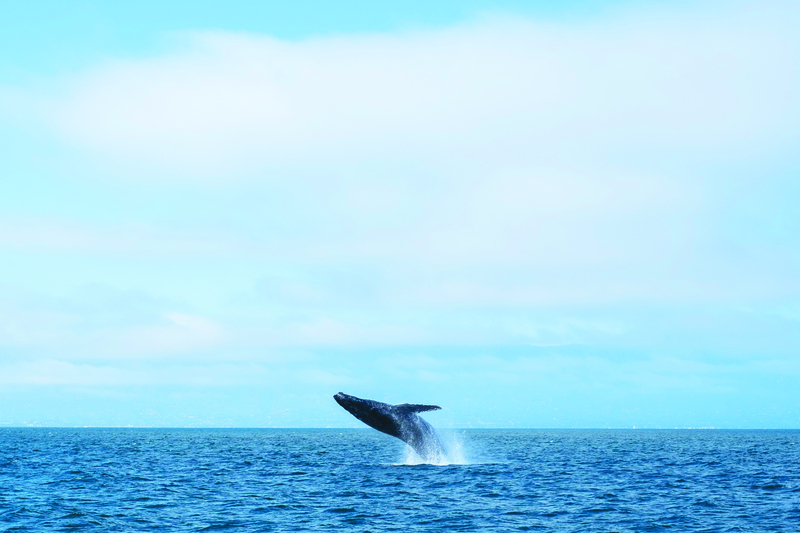 Humpbacks breaching against the backdrop of the Channel Islands drew passengers to the bow of the boat. The captain’s voice rang out: “Okay, folks, we have a pair of humpback at 3 o’clock — take a look.” On this day in the Santa Barbara Channel with Island Packers Cruises, passengers saw more than 10 humpbacks, a gray whale, and several dolphin pods. Even the seasoned crewmembers called it an impressive day on the water. Boating the channel often carries the exciting potential to see some of the 28 species of marine mammals found here. Winter is the ideal season for whales, as they migrate along our coastlines. According to Judy Oberlander, a volunteer with Channel Island National Park, recent outings have even spotted orca pods. There was a feeling of awe and anticipation onboard that day as we kept our eyes peeled for the spray of a blowhole or the flash of a bowed tail. Several pods of dolphins frolicked alongside the boat throughout the day, delighting in the wake of the ship. The crew explained that for every dolphin visible on the surface, 5-10 were swimming below, meaning that at one point, we may have been visited by upward of 3,000 dolphins. Photo: Doug MangumExperienced boat captions have a knack for finding the right time and place for whale sightings in Santa Barbara’s big front yard. Boating in the channel also offers wide views of the shoreline from Ventura to Santa Barbara and a closer look at San Miguel, Santa Rosa, Santa Cruz, Anacapa, and Santa Barbara islands and their surrounding waters. After a particularly stormy winter, crewmembers said they’re excited to get back on the water more regularly and enjoy spring’s warmer weather. Island Packers operates several days a week out of Ventura Harbor, a bustling shopping and dining destination with nearly three dozen storefronts, including restaurants, galleries, and shops filled with beach essentials, local art, souvenirs, and handcrafted jewelry. Like its sister location in Santa Barbara, Ventura’s Brophy Bros. is a popular culinary experience, featuring fresh seafood, handcrafted cocktails, and harbor views. Just downstairs, Fratelli’s Pizza and Brew is ideal for family-friendly quick bites. A short walk away, Coastal Cone serves up 46 ice cream flavors, complete with their signature Taiyaki cone, a fish-shaped waffle treat — a great way to end a great day on the water. Winter whale watching with Island Packers runs through mid-April; summer trips start up mid-June. Wildlife-viewing trips to Anacapa Island run year-round. For more info, visit islandpackers.com.